Oh shush. Yes I know. EVERYONE is doing pumpkin. Call me trendy. Can I help it that it’s what the kiddo wanted? And you know how I never say no to what the kiddo wants. And, besides, there’s a good reason everyone is doing pumpkin. It’s good. And seasonal. So, just give in already. Make the pumpkin stuff. Okay? In a large bowl, whisk together the pumpkin, flax seed, maple syrup, oil, almond milk and vanilla. In a small bowl, whisk together the sorghum, arrowroot, teff flour, baking soda and salt. Mix the dry ingredients into the wet ingredients. Stir in the chocolate chips or nuts. Spoon the batter into the muffin cups, filling approximately 3/4 full. Bake for 28-32 minutes, until tops are firm and a toothpick inserted in the center comes out clean. For more healthy recipes, visit Wellness Weekends at Diet Dessert and Dogs. This entry was posted in breakfast, desserts, pumpkin, vegan and tagged muffin, pumpkin, recipes, vegan. Bookmark the permalink. I guess it’s ok to follow the trend sometimes… Nice variation, pumpkin n chocolate chip! I am also making a lot of pumpkin recipes at the moment! as you said, it is seasonal! I agree! 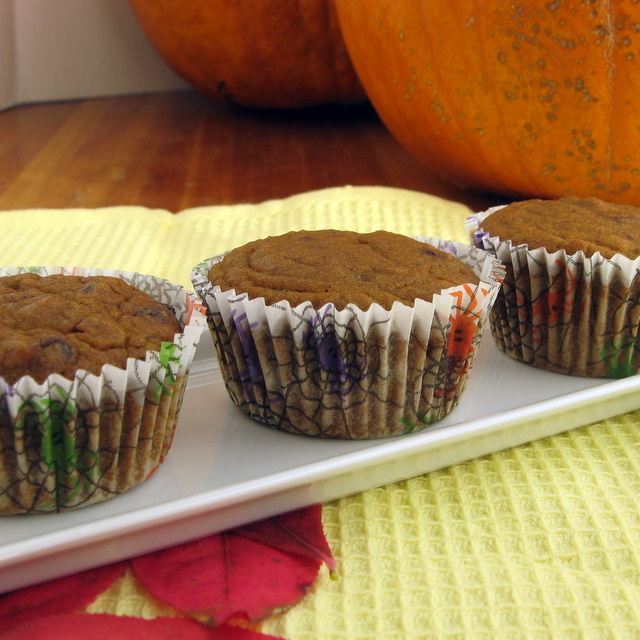 These pumpkin muffins look like a real treat! I can’t wait to try them even that I am not only eat gf! Thanks Sophie – I hope you do make and enjoy them! I had ripe bananas on the counter. Enter muffin craving, haha. So, to the internet I turned. I wanted something a bit healthier so I wouldn’t feel so guilty about putting away a muffin…or two. 😉 I stumbled onto this recipe for pumpkin muffins, and liked the ingredients. Only I had bananas. Not to be deterred, I made the recipe anyway, only substituting mashed bananas for the pumpkin….and it made the best, most wonderful little healthy muffins. Thank you! They only took about 20 minutes to bake.